Lindsay & Alyssa were wonderful, memorable clients who married in Beaver Creek, CO in July 2015. It was a real treat to see their wedding featured in this month's Martha Stewart Weddings magazine, photographed by the renowned Jose Villa. 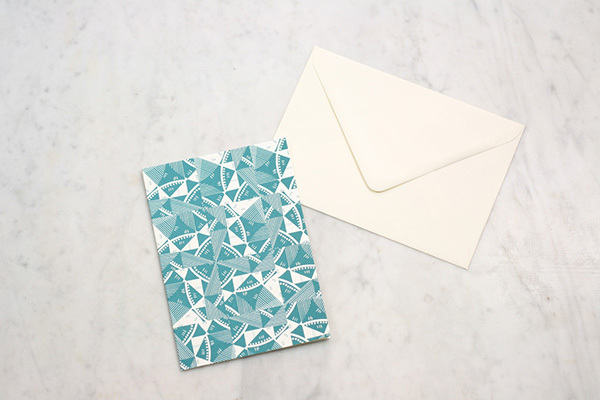 "After spotting her work in Martha Stewart Weddings, the couple asked Bryn Chernoff of Paperfinger to design all of their stationery. 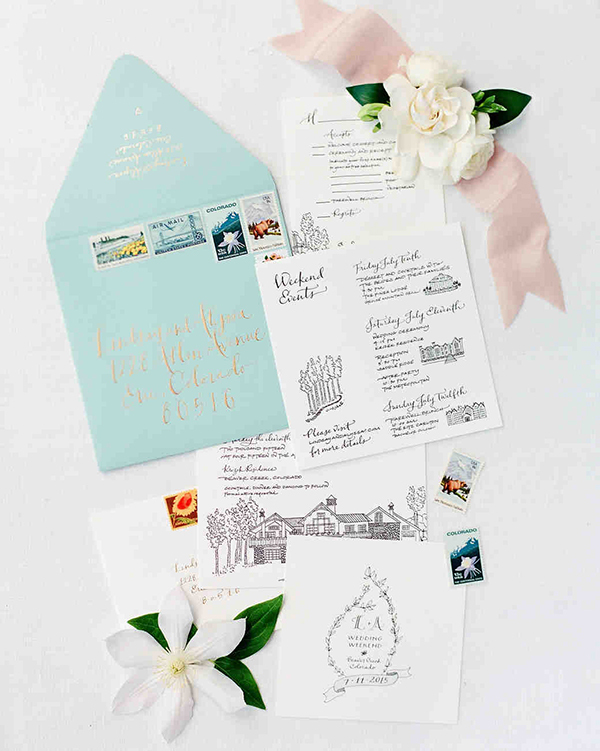 The hand-calligraphed suite, letterpressed on Crane & Co. paper, featured drawings of Lindsay's house, where the ceremony took place, and the other weekend venues. Chernoff also sketched wildflowers for custom envelope liners. Stamps, from My Vintage Post Office, showed Colorado and mountain scenes." Paperfinger had a role on nearly every element of the wedding. Custom illustrated monograms were made into water bottles for every guest in their welcome backpack. Maps, illustrated signage, programs, menus, the works. All photos by Jose Villa. Read the entire feature on MSW. These are images from Beijing native, Ji Zhou's series titled "Civilized Landscape" created using books, maps and photography to produce these urban and topographical landscapes. I'm so happy to be joining up with Jen Huang and Poppies & Posies for this three-day workshop series in April. It will be a beautiful setting in Santa Barbara and a great opportunity for folks to settle in to learn and practice photography, event design and calligraphy. For questions or interest, please email workshops@jenhuangphoto.com. Beautiful 5x5 card by Susa Talan, $4. Gwen Barba started Concarta Studio in 2010 to offer paper sculpture and decorative object design for custom clients. Her designs are pleasingly clean and fresh with added elements like watercolor to enhance her paper-cutting skills. Cake toppers, art, display pieces are among the various types of creations she provides to her clients. Contact Concarta for a custom commission. Claire Brewster hand-cuts maps to portray birds in flight in a series of beautiful art pieces, as in the above example titled We love this place. Below, The secret we are seeking. Enjoy the rest of the collection. Hey west coasters, I'm co-hosting a workshop with the super-talented Precious Bugarin for a two-part experience on the afternoon of June 21st. Hope you can make it! Learn modern calligraphy from me + how to make and assemble classy paper goods for your special event with Precious. (She is a master at elegant and modern paper construction for menus, programs, guest books, you name it -- very cool stuff. I've taken a workshop with her in the past and enjoyed it immensely. 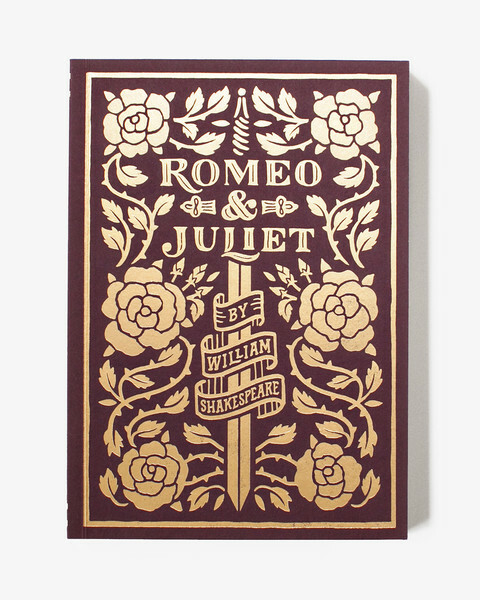 She currently teaches graphic design and designs invitations, brands, and books in her Portland studio. Snacks provided by M. Robin Cakes! The bride, Caitlin Watson Boyes, and her mother teamed up to create these fantastically-large paper flowers for her wedding in California last July. Such incredible creations -- and the scale! They used butcher paper and spent months creating these beautiful blooms that covered the reception area. Photos by Jessica Peterson. So thrilled with the images from Emily and Marco's wedding at Wave Hill, which is now featured in the 2014 Martha Stewart Real Weddings special issue. It was the result of a lot of hard work by a great team, listed below. Paperfinger contributed all the calligraphy for print and individual paper goods, as designed and produced by the superb Katie of Katie Fischer Design. You can see the calligraphy invitation suite pictured in the magazine's spread below. It was letterpressed and then each piece hand-painted with a light wash of watercolor by Katie. For a special client's birthday dinner, I used resistance fluid to create these watercolor washed place cards on soft Arturo paper. Here's a video of the indigo watercolor being applied -- I found it mesmerizing! paperfinger calligraphy : watercolor resistance from Bryn Chernoff on Vimeo. This lay drying on a spread of magazines in the studio this week. 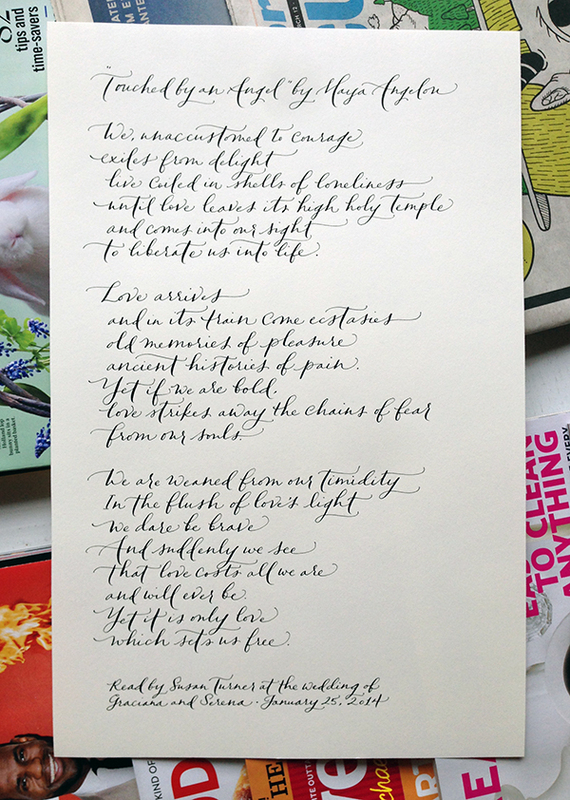 I feel grateful for the time I spend transcribing a poem like this -- it's the best way to meditate on the words, writing them slowly and carefully. The complete poem text by Maya Angelou is below. We, unaccustomed to courage exiles from delight live coiled in shells of loneliness until love leaves its high holy temple and comes into our sight to liberate us into life. Love arrives and in its train come ecstasies old memories of pleasure ancient histories of pain. Yet if we are bold, love strikes away the chains of fear from our souls. We are weaned from our timidity In the flush of love's light we dare be brave And suddenly we see that love costs all we are and will ever be. Yet it is only love which sets us free. Visit the shop page for information on my transcription offering for poems, letters or any words of your choice, starts at $125. 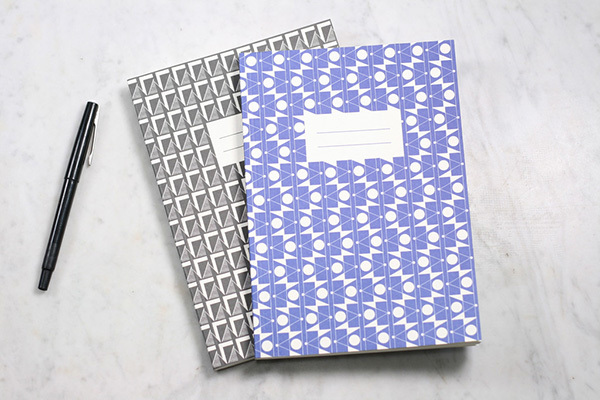 For those of us with a never-quenchable appetite for paper goods, check out the English line of Esme Winter patterned notebooks ($12-18) and note cards ($4.50), available at the sweet online shop, Flotsam + Fork. Paperfinger contributed a new invitation design along with menus and place cards for a wintry wedding scene produced by Luxe Event Productions, shot by Hazelwood Photo and flowers by Swoon Floral Studio. Check out the full feature and gallery on Style Me Pretty. 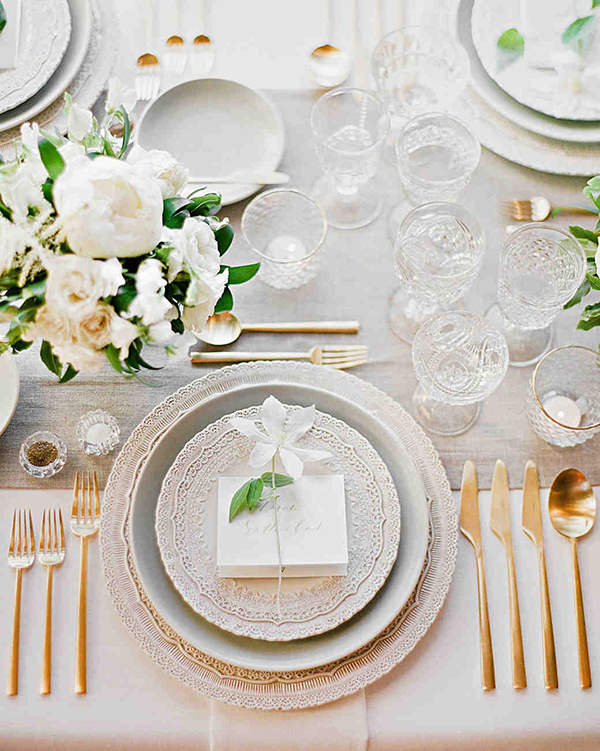 Sierra & Juliet (the Poppies & Posies team) kept it simple, but of course it was elegant and dreamy. They sourced all the flowers on site and added these beautiful blue tablecloths to highlight the gold place cards and brilliant bougainvillea blossoms. And I wrote the calligraphy for all the guest names.